Mexico first participated at the Olympic Games in 1900 and has sent athletes to compete in every Summer Olympic Games since 1924. Mexico has also participated in several Winter Olympic Games since 1928, though has never medaled in the Winter Olympics. Mexican athletes have won a total of 69 medals with diving as the top medal-producing sport. The National Olympic Committee for Mexico is the Mexican Olympic Committee and was created in 1923. Mexico was the first Latin American nation to host the Olympic Games on one occasion. Numbers of medals won by Mexico at the summer Olympic games from 1896 to 2012. Enriqueta Basilio lighting the cauldron at the 1968 Mexico City Olympics Opening Ceremony, she was the first woman to do so. 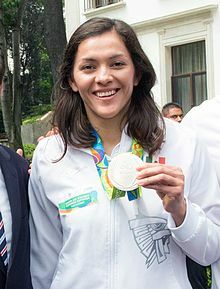 Taekwondo practitioner María Espinoza has won a complete set of medals at the Olympics for Mexico. Diver Joaquín Capilla won four olympic medals representing Mexico. Joaquín Capilla is the Mexican athlete with the most medals, four, and the first Mexican athlete to obtain medals in three consecutive games, while Humberto Mariles is the only double Olympic champion, also the Mexican athlete with the most medals at a single Olympic games, with three in 1948, and got Mexico's first gold medal. In 2016 María Espinoza became the first Mexican female to win a medal in three consecutive games. "Results and Medalists — Mexico". Olympic.org. International Olympic Committee. This page was last edited on 16 February 2019, at 03:03 (UTC).